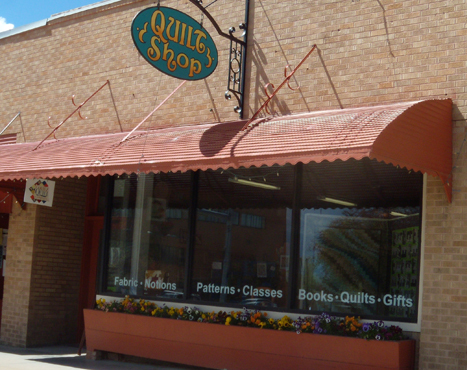 The Quiltzette - News from Cortez Quilt Company - Anniversay Sale This Saturday! Cortez Quilt Company is turning three. It’s our three-year anniversary and we're having a SALE! For this (and only this) we will take phone orders on Saturday for anyone who is out of town. Please call in the afternoon after the hoopla dies down a little. Yes, you may extend your current membership for another year at this low price! Also, we’ll be revealing all of this year’s Christmas fabric and fabulous samples for the first time. We have kits made up for most of the samples. And if that’s not enough excitement for one day, we’re participating in BERNINA’s one-day Back to School Special . . . 0% financing for 36 months with a $3,000 minimum purchase. (See more details about financing on this page.) You can apply for your BERNINA credit card ahead of time here. Mark your calendar and we'll see you THIS Saturday! This special Saturday morning event is for everyone who has taken Beginning Quilting at Cortez Quilt Company since we opened three years ago. Bring projects you have made since you started quilting for show and tell, or just come and enjoy seeing what others have done. We’ll present a short video on how fabric is made (courtesy of Cotton + Steel, a new fabric company), have demos, door prizes, and everyone who attends will receive a free pattern. Sign up for this fun event today by calling 970-565-7541. We have a large group of customers wrapping up our most recent Mystery Quilt program. We hope you’ll all come on Saturday morning, September 27, to share your finished quilt. Like last time, those who attend and sign up for the next Mystery Quilt will receive 10% off fabric for their next project (you must sign up and purchase your fabric on the day of The Big Reveal). If you didn't participate in the most recent Mystery Quilt you can still join us on September 27 to ohh and ahh over the beautiful quilts and sign up for the next one. Refreshments provided, so please RSVP. NEW . . . Placemat Club! We're kicking off our new monthly Placemat Club on Tuesday, September 16. Each month (third Tuesday) we’ll choose a different pattern and make placemats which, as we all know, are a great way to brighten any table. And they make wonderful gifts. This month we’re making “Table Toppings” (shown here). 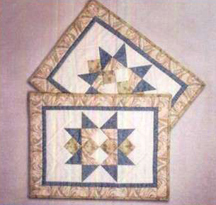 The pattern also includes a table runner and table topper. Judy Bryan will host our Placemat Club in September. fun classes we have on the schedule!